The Moncton Seniors ARC, Inc. was shelved in 2004 with its members continuing their association through membership in MAARC, Inc. As a result, a high percentage of MAARC, Inc. members are former members of the Seniors Club. MAARC, Inc. is affiliated with Radio Amateurs of Canada, Inc. and a member of the American Radio Relay League, Inc.
MAARC, Inc. maintains membership in the principal Canadian and USA national Amateur Radio organizations. Their technical and organizational publications provide MAARC, Inc. members with information of the latest advances and national/international happenings. 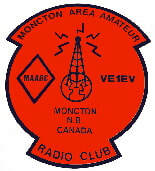 The Moncton Area ARC, Inc. has installed amateur radio station facilities and associated antennas at its Club rooms, including an Amateur Space Station for the use of all members. The Club station is capable of remote operation. This is of particular advantage to members who have moved to Senior type accommodation where operating an Amateur Radio station is severely restricted or prohibited. Instruction on new and special operating techniques is offered as the need arises. Organized training sessions in Morse code, technical theory and certain operating specialties such as the Space Station, VE9MSC are conducted on an organized basis. MAARC, Inc. operates the The Bob Sherwood Memorial QSL Bureau serving Radio Amateurs in NB and PEI holding VE9 & VY2 prefix call signs.